The Final EIR (FEIR) on the Verdugo Hills Golf Course site (now referred to as the 6433 La Tuna Canyon Road Project) was released on September 24, 2018. While there is no public comment period for a Final EIR and no public comments are required by the City, this document contains the City’s response to the comments made on the Draft EIR (DEIR) in 2009, and the re-circulated portions of the DEIR in 2015 and 2017. IF YOU SUBMITTED COMMENTS ON THE DEIR ON ANY OF THOSE OCCASIONS, PLEASE REVIEW THE FEIR TO SEE HOW THE CITY RESPONDED TO YOUR COMMENTS. IF THEIR RESPONSE IS INADEQUATE OR INACCURATE, PLEASE SUBMIT NEW COMMENTS EXPLAINING WHY YOUR ORIGINAL COMMENTS HAVE NOT BEEN ADEQUATELY ADDRESSED. We expect the first in a series of public hearings on the project to begin in late November 2018. This will be another chance for the public to make their feelings known about development of the Verdugo Hills Golf Course site. The City Released Recirculated Portions of the Draft Environmental Impact Report regarding a proposed development for the Verdugo Hills Golf Course. The STNC encourages stakeholders to read and comment on at least one portion of the recirculated sections if you care about the future of this important and historic site in Sunland-Tujunga. The close of public comments is January 19, 2016. Extended to February 3, 2016. The STNC also encourages you to attend upcoming STNC meetings, City hearings and meetings regarding this site. Check this page and the Calendar on the STNC website. Scroll down to the bottom, click on the Down Arrow to begin, and then click on GO. You can also review the Draft EIR at the Sunland-Tujunga Branch Library at 7771 Foothill Boulevard, Tujunga or at The Sunland-Tujunga Neighborhood Council office now located at 8250 Foothill Blvd., Sunland. Why are the above sections being recirculated? Are they showing more impacts than originally? Are they showing fewer impacts? Either way, do you agree with the revised Section? Bring up all possible objections and concerns that you have about the Revised Sections of the EIR. Your comments should be as detailed as possible and include facts and information upon which they are based. Include who you are, your professional and community affiliations too. If you need assistance, ask at the upcoming LUC and STNC meetings. 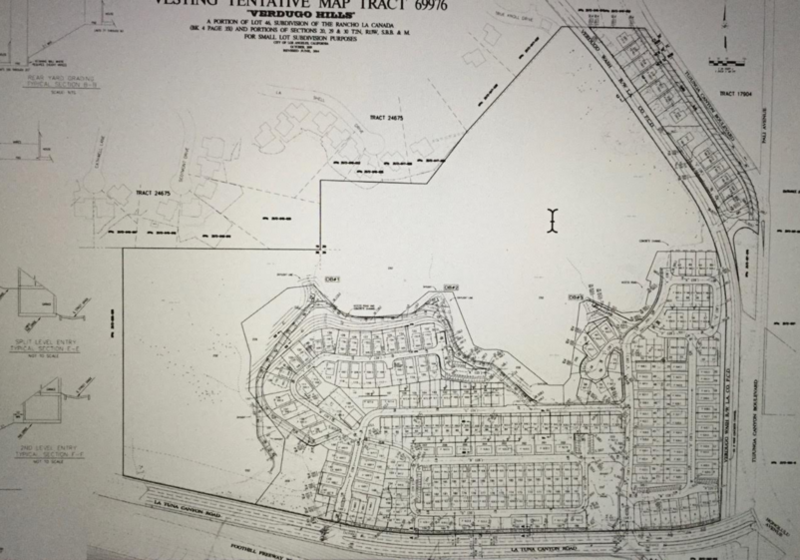 Image of Alternative #6, the preferred alternative presented in the RP-DEIR showing Small Lot Subdivision. To see more details, go to the actual RP-DEIR document link above. 10-7-15 -- The recirculation of the DEIR is expected to be released in the next couple of weeks. Link to Architect's Oct. 20 presentation at the Land Use Committee. If the link does not connect from this page, copy and paste the link below into your browser and it should work OK. Thank you!